Fall is in The Air. November Report. Fall is in the air. November brings shorter days and cooler temperatures. With our clocks turning back, the days have become shorter and temperatures have fallen. If Mother Nature cooperates, November can be very productive month. Snook have started their migration to the back country, a few schools of redfish will be willing to play, although closed in our region, big trout will invade the flats and the mackerel will be around as long as temperatures stay warm. It started last month and should stay as long as the weather cooperates. With water temperatures hovering around the 72-75 degree mark, look for the spanish mackerel bite to stay hot all month long. 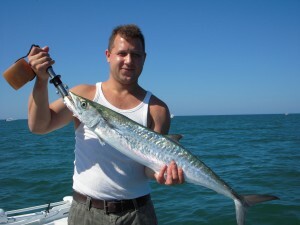 There are several ways to fish for mackerel. I prefer to find a spot with lots of structure, like a ship channel ledge or an artificial reef. The structure will hold bait and mackerel are in search for an easy meal. Anchor up tide of the structure, set out a chum block, some live chum and you are sure to attract some mackerel attention. A 40lb Berkley fluorocarbon leader with a long shank hook will increase your hookups. If you looking for the real smokers (king mackerel), the best place to start is the Skyway Bridge. Same approach as the spanish mackerel but with heavier gear. Steel leader 20-40 lb is a must. Live blue runners or threadfins will get the job done. The Tampa Bay charter redfish bite was a little inconsistent last month. Some days were good and other days not so good. There have been some decent schools in the Tampa Bay area but not like in the past. The fish we have been catching are in groups of 2-6 fish. On low tides, fish the drop offs on the edge of the flats. As the tide moves in, fish mangrove trees, oyster bars and points. If you are out on the flats, always keep your eye out for schooling fish. We should still see some schools on our flats this month. When searching for schooling fish, I look for the schools of mullet. This is a good sign that some fish are around. I also like to fish the schools of mullet. Redfish and other game species like to hang around and feed on anything the mullet kick up. Snook season will remain closed but catch and release is still an option. This year will be very interesting for us in this region. I think we will get a good gage on how the snook population was affected. There still are some nice fish to be caught. Areas north of Apollo Beach seem to be okay. The Tampa Bay snook have started to make their move to their winter spots so look at some of the usual stopping points in our area. Piney Point and Cockroach Bay is a good starting point. Tidal flow is important any time you are targeting snook. Target areas where the tide flows with good ambush points. Live scaled sardine (white bait) on a 30lb Berkley fluorocarbon leader with a 1/0 Daiichi circle hook free lined will be a winner. Remember to handle these fish with extreme care and as little as possible. We need to take care of the ones we have. Trout season will close this month and remain closed through December. With the cooler temperatures, we will see some of the big gator trout invade our flats. Trout are a good species to target with artificial. Top water plugs to soft plastics and everything in between will work. My go to bait is any white body soft plastic rigged weedless. Remember they have a protective coating so try not to handle them and use a dehooker to release them. Grouper will continue to make their way into our region. A great starting point is the ship channel. Troll a Manns Stretch 30 plug or a white buck tail jig and you are sure to score some nice gags. Be sure to keep an eye on the grouper changes coming down. Look for sheepshead to start to show up in our region. Most structure will hold sheephead. Dock pilings, rocks, and jetties. I like shrimp on a jig head. As water temperatures cool, more fish will show up.